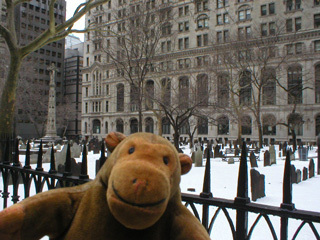 "The oldest grave in New York is over there, somewhere"
Outside Trinity Church Mr Monkey couldn't help noticing Trinity Churchyard, one of three cemeteries associated with the church. Some of the oldest graves in New York are in this cemetery, but Mr Monkey wasn't keen on wading through deep snow to see them. 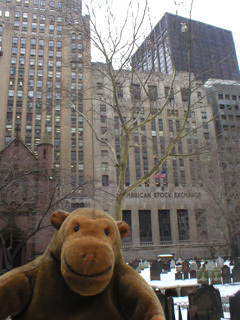 On the other side of the churchyard, he spotted the American Stock Exchange, which was the Curb Exchange when it started in the 1840's, because the traders traded on the sidewalk outside the New York Stock Exchange. They didn't get fed up of being outdoors until 1921. If you go to the Trinity Church website cemeteries page, and look for the online databse link, you can see who was buried where.